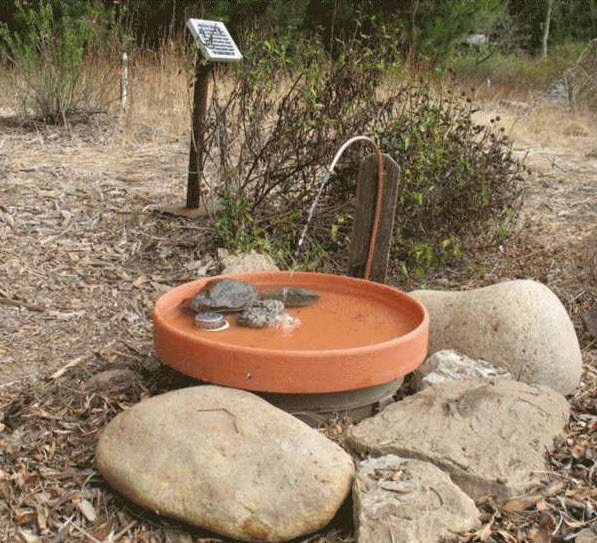 Make a birdbath that has running water and is powered by solar energy! Get two wood dowels and two small rectangles of wood, and attach the dowels vertically on the rectangles to make two stands. Attach a solar panel on one stand and a curved pipe on the other stand. Cut out a notch from the top of one bucket that is large enough for the wires to fit through. Drill holes in the base of another bucket, and put the notched bucket inside the bucket that has holes. Cut out a hole from a plastic planter dish, and install a standpipe in the dish. Cut another hole in the planter dish and install a gasket for the water pump outlet. Wire the solar panel to the pump, and attach an air hose between the water pump and curved fountain pipe. Bury the larger bucket in the ground, and put rocks around the top and inside the birdbath area.